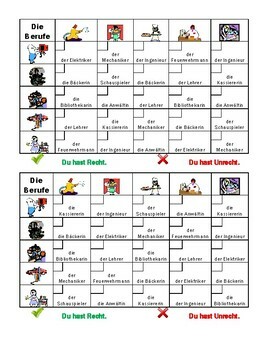 Includes 20 of my products which are listed individually to learn and practice professions in German. 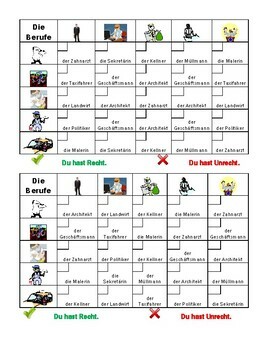 Partner activity to use the 10 vocabulary words pictured. Student A designates a box by calling its coordinates (die Kassiererin und der Mechaniker). Student A then guesses which of the 10 words are in that box. Student B responds either Du hast Recht or Du hast Unrecht. 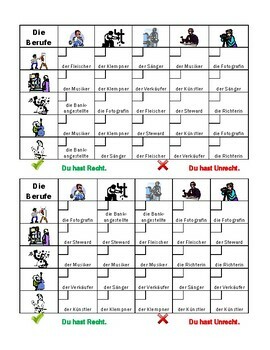 Students alternate turns until both sheets have been completed. At the end of the round, students add the number of checks to see who wins. 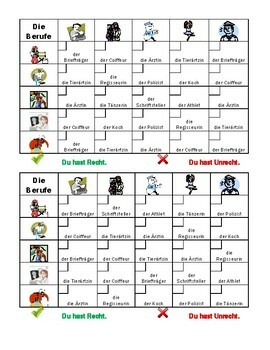 Includes 4 separate games, covering 40 different vocabulary words.